In Place de l'Hôtel de Ville take the pedestrian underpass to Quai de l'Hôtel de Ville, walk upstream along the quay for 100 metres. The stop is on the right in the square. 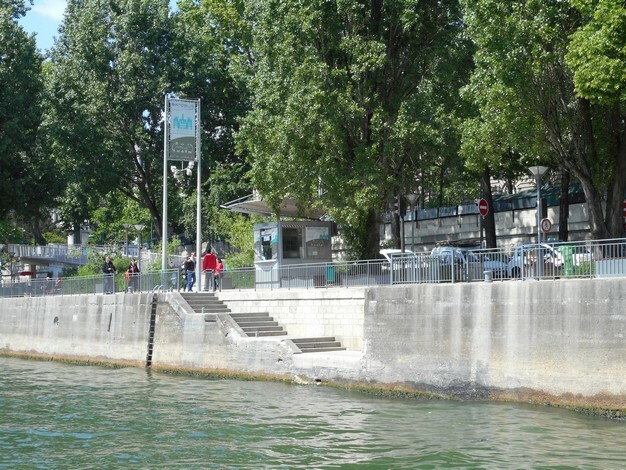 There used not to be a quay here, just the shore that sloped gently from Place de l'Hôtel de Ville to the Seine. The place was called 'Place de Grève' (Shore Square) until the nineteenth century and was for a long time the scene of executions and the place where journeyman were hired by the Seine boatmen. This stop is the one for a likeable and historical part of the Paris. The Marais, Saint-Paul and Saint-Gervais are surviving areas where old houses look out on to the last cobbled lanes. But that's enough of the past. 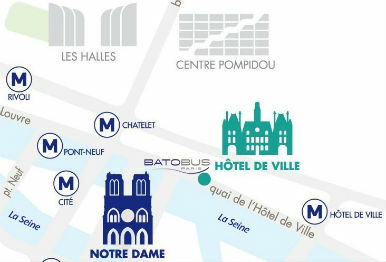 With the Pompidou Centre (Beaubourg), the Picasso Museum, boutiques, eclectic bars of all persuasions and the lively Jewish quarter, the port at Hôtel de Ville also feels the vibrations of modernism.